Wow, very cool stuff, as usual. Great review, John. 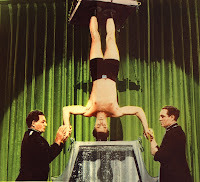 It is amazing how many people this film has converted into Houdini followers. It's very enjoyable for what it is. I wouldn't have it any other way. Curtis actually does convey something of Houdini's obessive nature and love of applause. Plus, Janet Leigh doesn't hurt the eyes. Still, it would be nice to have a grittier, more accurate movie about him, maybe the sort of multi-part period drama that the BBC is good at. Thanks as always gang. I don't consider this article finished just yet. I wanted to flesh out the paragraph about Christopher's negative reaction (I believe he evokes objections from Sid Radner, Manny Weltman, etc.). However, when I went back to the Academy library on Friday to make a copy of the review, I found they are closed until Jan. 3. As I promised this for this weekend, I put it up as is, but when I get my hands on that review in the new year I'll add to this. I actually came very late to this film and to Houdini himself. 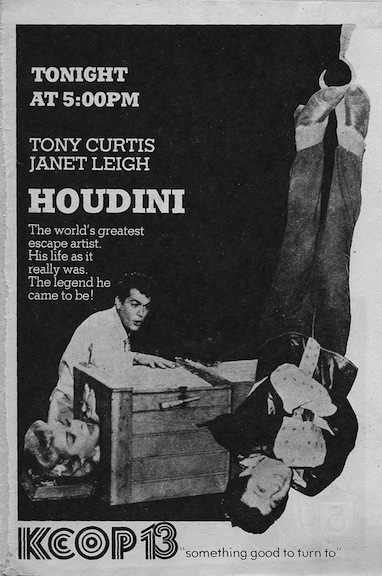 I only found a copy of this on DVD a few years ago and the first HH biography I read was Secret life of Houdini. I actually read this book before seeing the film. And have been performing escapes long before that. 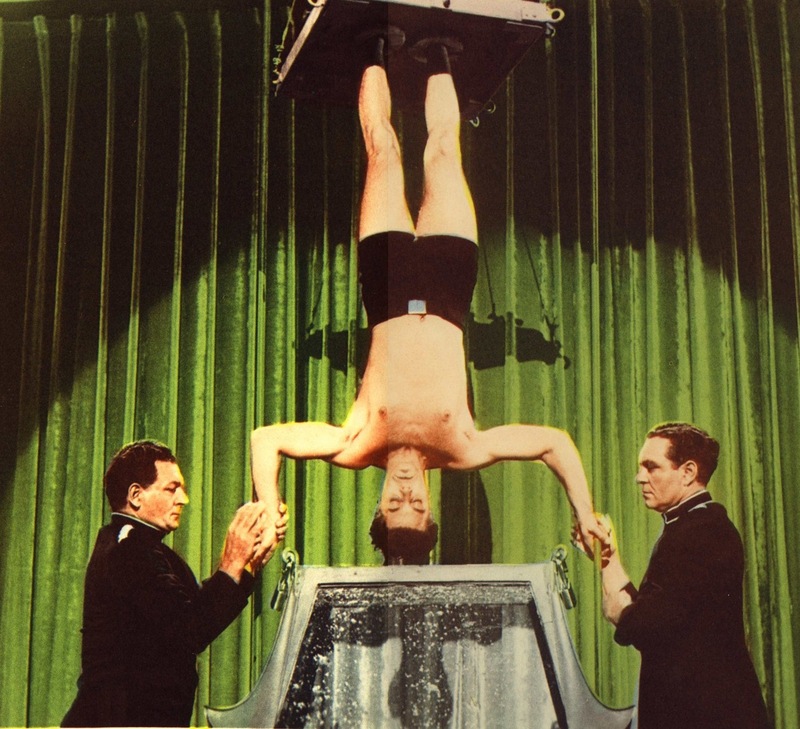 So unlike most it seems it was my love of escapology that brought me to Houdini rather than the other way round. I do love the film though. And would also love to see a more factual period drama about HH made. John - You are truly a devoted Houdiniphile. When I interviewed Janet Leigh for my story about Bess in MAGIC magazine, she told me it was costumer Edith Head who convinced Paramount that the film should be shot in Technicolor. 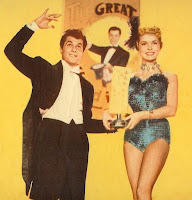 She took one of the costumes to George Pal and said "This film must be made in color!" Edith Head did have a lot of clout in those days and I'm sure the studio realized the story would be much richer in color. 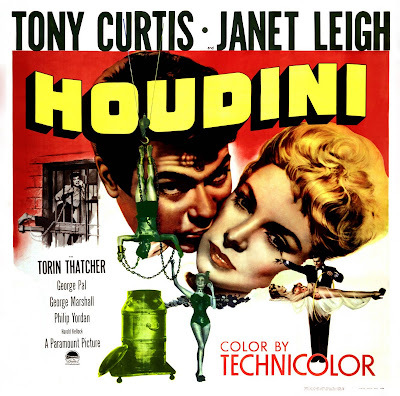 Janet also told me that in the dramatic scene where she's in the empty theater pleading with Houdini not to perform the USD that George Marshall positioned a bucket of water directly over her head (unknown to her) and after she delivered her plea to Harry, the water was dumped on her head! Would love to find that out take! 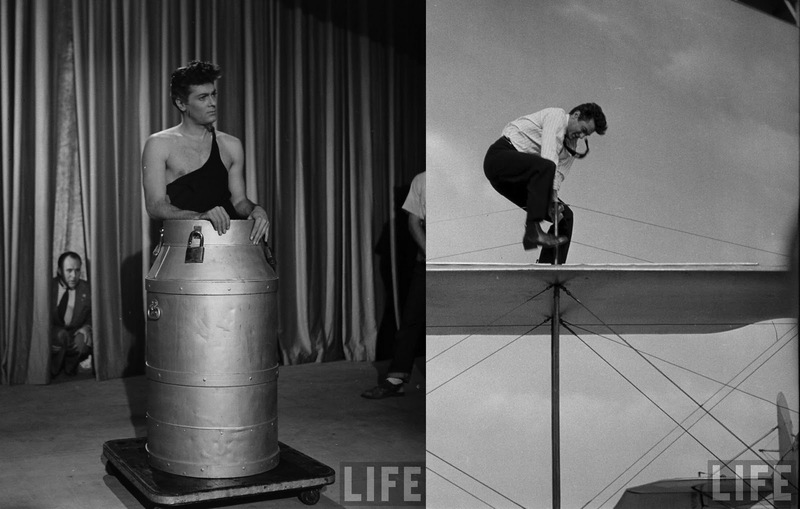 How about the footage of Tony doing the milk can escape and the airplane stunt? Does it exist anywhere? What a crime if it is lost to history!! We can only hope it still exists. But chances are it's long gone.